Several months ago I read Matt Taibi’s review of Kathryn Bigelow’s Zero Dark Thirty in the Rolling Stone. Taibi wasn’t so much reviewing the film for quality or watchibility–though he was impressed by both–but for his reaction to how an American director of Bigelow’s caliber would portray the events leading up to the CIA’s execution of Osama Bin Laden, and specifically the use of torture to obtain the information from detainees needed for the op. Although Taibi admitted to applauding along with the rest of the theatre when Bin Laden was killed, he reacted uncomfortably to Bigelow’s apparent ambivalence to the torture. The movie opens with a waterboarding scene, and though the new CIA agent in the field in Pakistan looks sickened by the events, a half hour or so into the film she is busily engaged in torture techniques of her own. Although it can be argued that Bigelow is simply portraying events as they happened rather than making a moral statement, the torturers in the film are also the protagonists. You are forced to identify with them. They face obstacles and surmount them. They are heroically tenacious in their efforts to bring Bin Laden to justice. They are uniformly physically attractive and at times emotionally vulnerable. In short, they are the good guys. And the good guys had to use torture to get the information they needed. Otherwise none of their detainees would have talked. I kept thinking of Nietzsche while watching the film. Be careful when hunting monsters you do not turn into one. It has been said that Bin Laden’s greatest triumph over the U.S. was not 911 but Abu Ghraib and Guantanamo. It revealed that the great democracy was an outlaw, an oppressor. It had been caught with its pants down around its knees and tarnished its own image in the eyes of the world forever. It would be simplistic to dismiss Zero Dark Thirty simply because it portrays torture as a necessary component in the hunt for Bin Laden. The world was an extremely dark and confusing place in the years following 911. In some ways it still is. Radical Islam is a movement more suited to the dark ages than it is today. We just don’t know how to deal with it, and since honour and shame and salvation are primary motivators for its adherents, it would make sense to use those tools against them when we were desperate. For awhile, we all reverted to a pre-enlightenment mentality, motivated by fear and outrage and injury. The cold war is even briefly referenced in the movie, when it was stated it was easier to turn people with offers of money then since Al Queda were radicals and not motivated by profit. Bigelow is a marvelous filmmaker. It is impossible not to admire the no-nonsense, documentary style of her film, and the short bursts of intense drama that move the narrative along. It is also not possible to watch the film and worry that once we go down the torture road, it might be extremely hard to turn back. Several of the characters complain that since the Abu Ghraib scandal it was impossible to get the information they needed, and one, a director at the CIA, laments that since the prisoners at Camp X-Ray had “lawyered up” they couldn’t be approached. In other words, since the rule of law had once again been applied at these camps, no more useful information could be had. The United States, and other great democracies, were built on rule of law. Though it is not the film’s intent, Zero Dark Thirty reminds us that for a few years we slipped back into a momentary barbarism. And worse, it was this barbarism that allowed us to capture the greatest enemy the United States has ever known. For thousands of years we have known that torture is an extremely effective way of gathering intelligence information. But somewhere along the line, mostly likely when we began imposing rules of law and constitutions and declarations of basic human rights, we decided, collectively, that not knowing was better than knowing under certain conditions. Even if it meant more people would die. For if they take our lives, and then savage our dignity and our most valued traditions also, then they have truly beat us. We stopped short at shearing off their heads in front of cameras, but really, it is only a matter of degree. Writer and thinker Christopher Hitchens argued that waterboarding was not torture, until he agreed to be voluntarily subjected to it, and then admitted wholeheartedly it was. Probably while he was still trying to clear his throat and nose of excess water. If I had been directing Zero Dark Thirty, I might have asked that I be subjected too, so I could experience the reference points of all the people in those torture rooms. 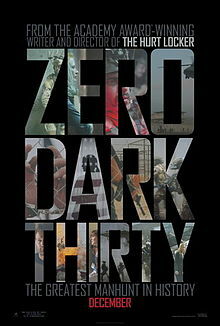 For despite being a very good film, Zero Dark Thirty is ultimately a good buy/bad guy flick. It is a revenge movie. And revenge movies, for as satisfying as they can sometimes be, simplify complex events. Homer wrote an entire epic poem, The Iliad, on the uselessness of revenge, and how one offensive in the name of it simply launches another in return until the field degenerates into a chaos of confusion and slaughter. Troy eventually falls, but Aeneid, her son, founds Rome, which eventually goes on and conquers Greece. No-one ever wins these things. Declaring a war on terror is like declaring a war on a cloud. It is too amorphous, too nebulous, to attack. Despite the death of Bin Laden, we’re losing that war. Robert Kaplan said that when a country can no longer protect its citizens it has ceased to function as an entity. Writer Homer-Dixon believes, with the proliferation of technology in the hands of radicals and a country’s inability to effectively patrol its own borders against them, we are moving toward city state societies. Israeli writer Martin Van Creveld agrees. You may get the impression, from watching Zero Dark Thirty, that we are winning the war on terror when the truth is just the opposite. The very fabric and structure of our society has changed because of it, and will keep on changing. One of the characters in the film mentioned that any kid from the Internet can build a bomb and detonate it. For a minute there I wondered if Bigelow did see the true problem. It’s not radicalism, for that has always existed. But radicalism with potent technology in its hands, which is something new in the annals of human history. Edward Said said the war of the future is not the east against the west, but fundamentalism against modernism. Bigelow seems blind to this. The story she was telling was not the real story, but simply a sidebar. Give it a few years, and we may see the actual crux of the problem. I did actually enjoy the film, despite my complaining, but these questions and ruminations kept occurring to me throughout. Natural with a subject so controversial.